Visit to Nababeep and Okiep. Two towns close to Springbok, that used to be part of my sales territory, are Nababeep and Okiep. Both are old copper mining towns that have now shut down all mining. I think the last mine to shut down was in 2003, and by the look of things they are both are battling to survive. 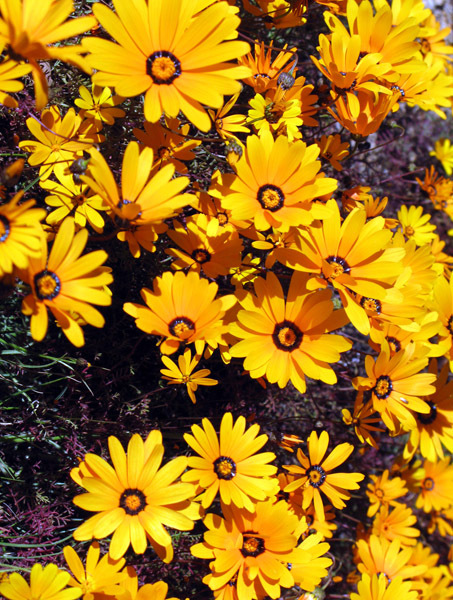 Saw this display of flowers just outside Nababeep. Nababeep is about 30km’s from Springbok and to get there one must travel on a road that has the most potholes I have ever come across on one road. They must like them because there are notices the whole way reminding you “Potholes”. The name Nababeep combines two Nama words, naba meaning “hump of an animal” and bib meaning “small spring”. 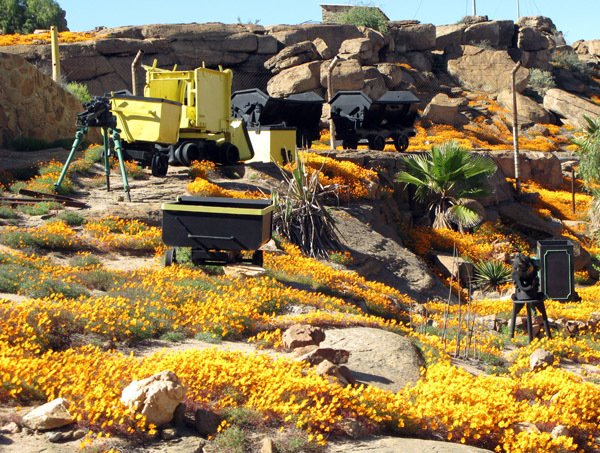 Mining began here in the 1850’s and from 1876 ore was taken through to Port Nolloth by train for export. 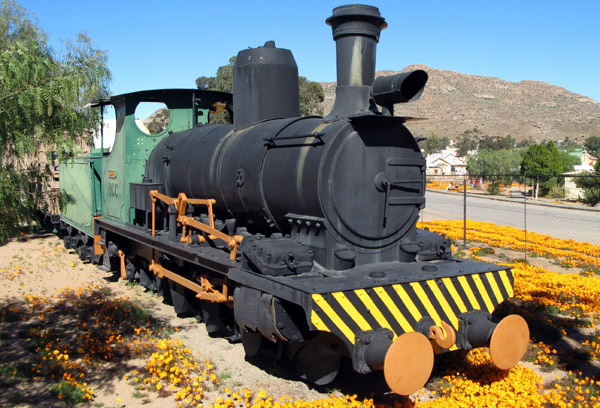 Clara, a narrow-gauge steam locomotive, used to rail copper ore to Port Nolloth. 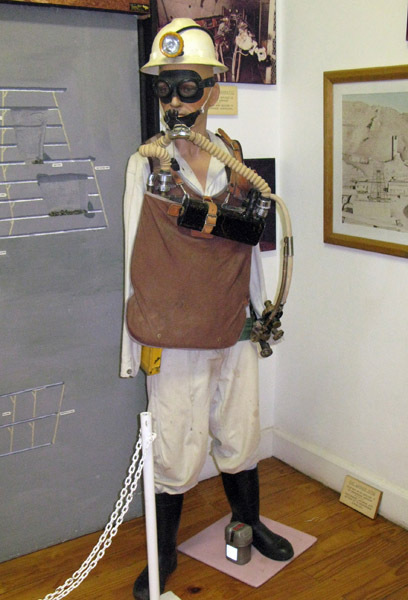 For some reason this outfit reminded me of George the diamond diver. 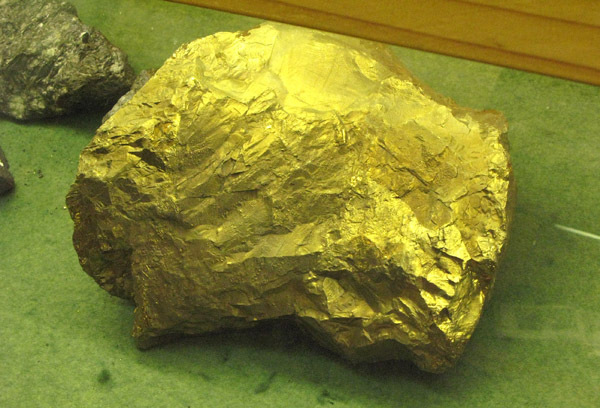 While having a look at all the ore samples in the museum came across this one and thought this must be the mother load only to be told it was a very poor sample and of no value. 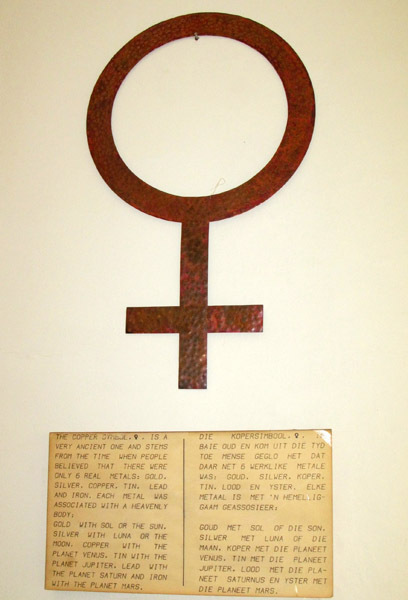 This symbol stems from the time when people believed that there were only 6 real metals – gold, silver, copper, tin, lead and iron. All anyone could tell me about this old building was that it used to be a video shop. 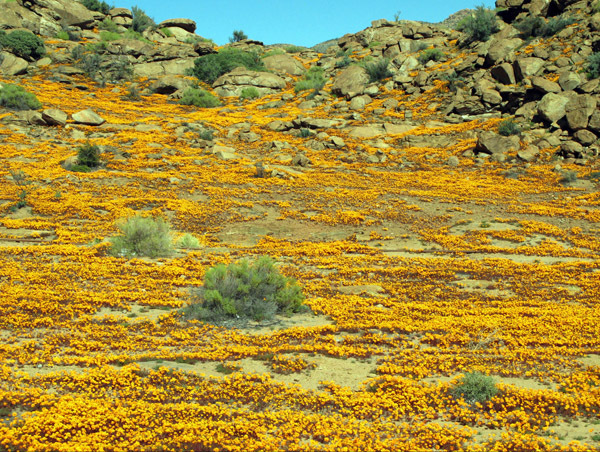 From Nababeep I drove back along the potholed road to get to Okiep which is only about 8 km’s from Springbok. Okiep derived it’s name from the Nama word ‘U-gieb’ meaning ‘the great, brackish spring’. It was , until production stopped in 1918 the world’s richest copper mine. 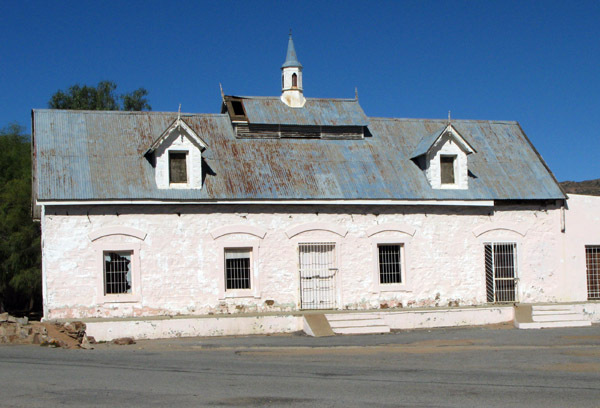 It was also the oldest mining town in South Africa where copper was first discovered and mined in 1855. Two of the main attractions to see are the Smokestack and the Cornish Pump House. 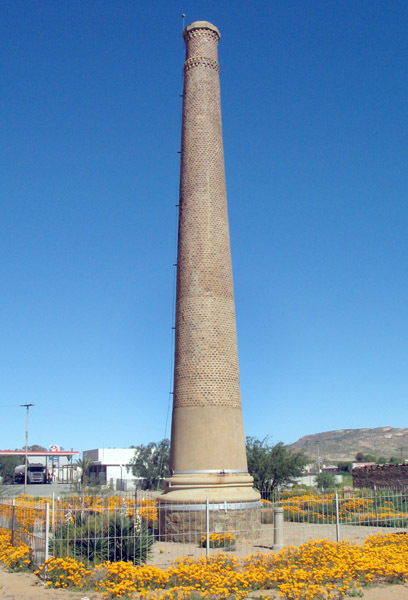 Smokestack built by the Cape Copper Company as a ventilation shaft in 1880 and which is now a national monument. 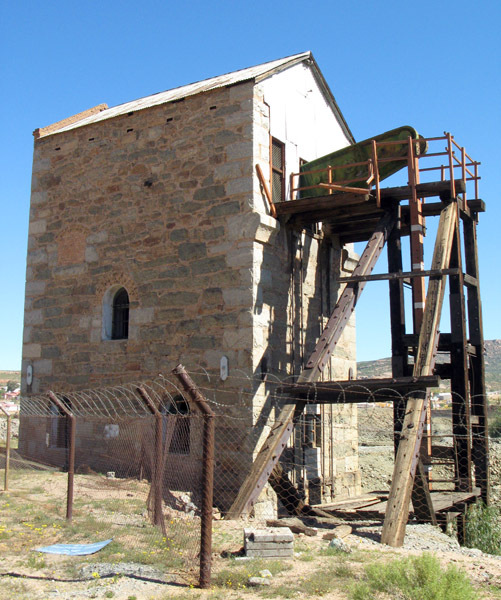 A fully intact steam engine and the only remaining pump house of it’s sort in the Southern Hemisphere was used from 1882 to pump water from the mine. All in all not sure what is going to happen to these 2 small towns. I remember Nababeep as being quite a modern progressive – for those days – town with a nice little hotel, golf course and other sporting facilities. Not much there now I’m afraid.